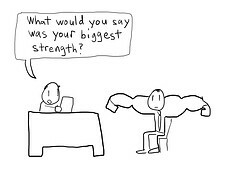 Job interviews. Honestly, it's been a really long time since I've been on any kind of "official" job interview. I can remember, though, the stress level, the constant smiling, and the being at the "top of your game" kind-of-feeling that can get really old, really fast. It's sort of like going on a first date - it's extremely awkward and everybody just wants to get through it pretty quickly without making a fool out of themselves! At the core of any job interview, or perhaps even a first date, is this key concept: "how useful is this person to my company, my family, or my life!" Will this person we are courting here fulfill the needs that we have? Can he or she accomplish the job that we need them to do? The best employee or maybe even the best spouse is that one who is the most useful. That probably sounds somewhat harsh, uncaring, or unloving, but it's true. Useful people get retained. Useful employees get raises and special treatment. Useful spouses are loved on and cared for. The husbands and wives that stick it out over the long haul are the ones that feel like they are getting a great deal and not a majorly raw one. The American Church and modern day Christianity has done an extreme disservice to people that are in the process of becoming believers. We've essentially lied to people and told them that all they need to do is pray a prayer and then they become members of the Christian Club. While I believe that we Christians have the best of intentions in our soul-winning efforts, becoming a believer in Jesus Christ is more than saying a prayer and getting fire insurance from eternal damnation in hell. It's about radical life change. It's about a relationship with the King of Kings. It's about serving King Jesus and seeing that His Kingdom is moving forward in this life and the life to come. According to these verses, the followers of Christ who are truly useful to His purposes are the ones that have turned from their sin. They have cleansed their lives and made themselves useful to God. They are prepared to do any and every good work that the Master calls on them to do. It's really hard to do the good works of the Master when we're entrenched in a lifestyle of sin that doesn't please the Lord. I don't know about you, but I want to be a special, useful instrument for His special purposes. I don't want to be common; I want to be uncommonly useful for the Kingdom. Where are you at today in your Christian walk? Are you a pretender, a fake? Maybe you prayed the prayer and you're talking Christianese, but you're not really walking the walk? I get it; I've been there too. At a certain point though, you will get to the place when you are tested in your faith and then you start questioning this whole Jesus thing. Why am I here? Did I really give my life completely over to the Master? Am I useful to God's Kingdom? Is there sin in my life that I need to confess and forsake in order to become useful for God's special purposes? I have no clue where you're at today in your spiritual journey, but I would encourage you to take some time to re-evaluate your walk with Christ and determine if your life is truly useful to the Master.